I was pretty late joining the quinoa bandwagon. As usual, I’ve finally gotten on board with a food trend about the time it’s probably slowing down. Is quinoa even still a thing that people are loving? Probably not, since I am now enjoying it! I never know what’s trendy. It’s a bit annoying how long it took me to actually try quinoa though, because now that I’ve finally discovered it, I would happily eat it all the time. I don’t, because I’m the only one in the house that enjoys it. I still haven’t managed to convince anyone else in my family that it’s tasty. More for me I suppose! 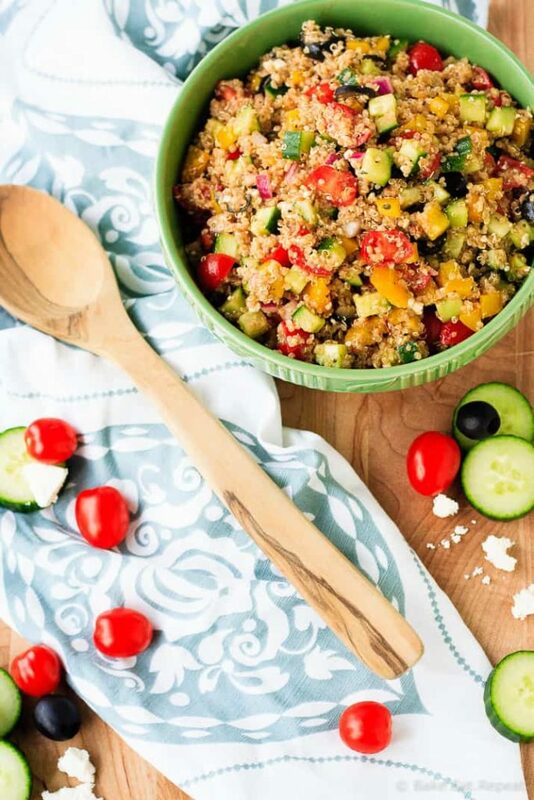 This Greek quinoa salad is really quick and easy to make, plus, it can be made well ahead of time. I made this for lunch for myself, and then served it with supper that night, and it was actually better after being refrigerated for a few hours. And, since I’m the only one that eats quinoa here, I had the leftovers for lunch for several days. It was the perfect lunch. The protein filled quinoa made it nice and filling, while still being light and fresh from the veggies and Greek vinaigrette dressing. If you want to make this more of a main meal, it was also great with some chopped, cooked chicken tossed in. I tried that one day for lunch as well and really enjoyed it that way. Actually, I enjoyed this Greek quinoa salad so much that I was kind of sad when it was all gone. And I was the only one eating it. That’s how much I liked it. Pretty sure I need to make it again, just for lunch if nothing else! It was kind of nice having a weeks worth of lunches ready in the fridge for me! I’ve also shared this Greek Quinoa Salad recipe over on Food Fanatic, so be sure to check it out over there! How easy is this! And we just love the health benefits of quinoa! Thanks for sharing! This is a great recipe to try. 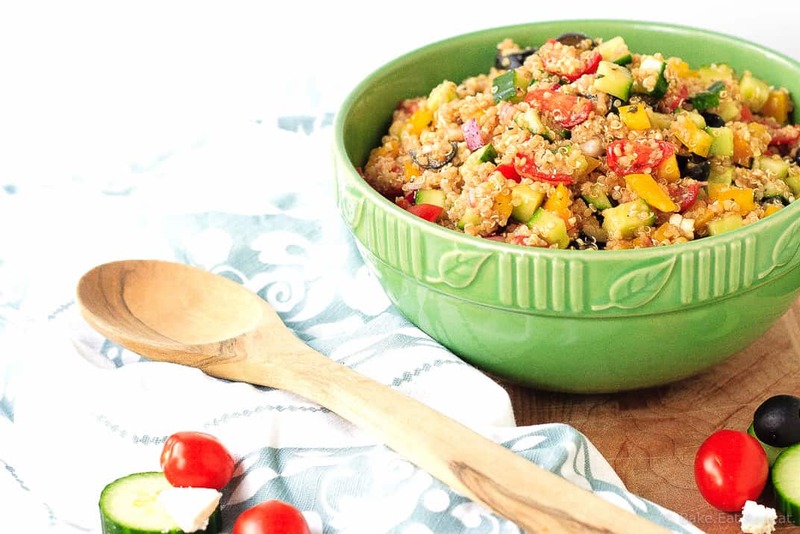 Super easy and delicious salad - I loved the quinoa in it! Thanks! 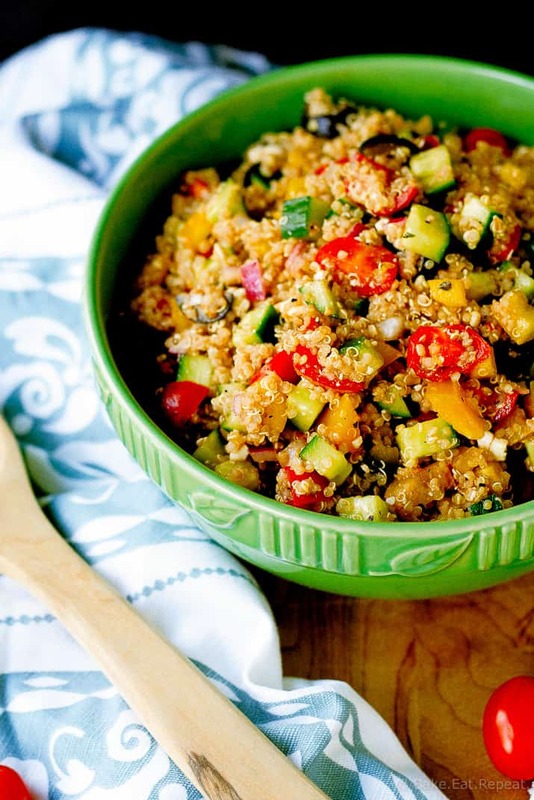 I love quinoa and this is one of my favorite salads! Looks gorgeous Stacey! I love Greek salad, and it was great with the quinoa! Thanks Mira! Beautiful!!! Looks so yummy and healthy! I'm not on the bandwagon yet, but maybe you'll convince me! Really awesome looking salad, Stacey! I think it really depends on what it's in. I didn't like it at all the first few times I tried it, but it was just plain quinoa. With other flavours I really like it, but my family is not convinced yet! I just started eating quinoa until 2 years ago and am hooked! So glad you are a fan now too! Love the Greek flavors in here, it sounds fantastic! I'm totally hooked, it's so good in so many different ways. Plus I'm not a huge rice fan so it's a nice change! Thanks Kelly! I was kind of late to the quinoa game too! My mom never cooked it when I was younger, so I didn't learn about it until college. Now I enjoy it a lot! This looks so good, I bought a giant bag of quinoa for a recipe and now I have to figure out what to do with the rest, I'm totally making this soon! It's amazing! Hope you like it too Sara! Quinoa is the bomb dot com!!! I am so glad you joined that train! Quinoa is yummy but I find hard to convince my husband too :/ lol anyway yeah more for us I guess! Love the greek salad Stacey, perfect lunch! More for us is the good part! :) With this one I was perfectly okay with no one else eating it, it was too good to want to share anyways! Thanks Manali! You know what is important? That you found quinoa! Its such a delicious grain that I don't see going away so recipe develope away! Yup, super delicious, and I love that it goes with pretty much anything! Thanks Meg! Yum! I love a good easy quinoa salad and greek... gurl thats right up my alley! so healthy and flavorful, love all the veggies and the bright colors. 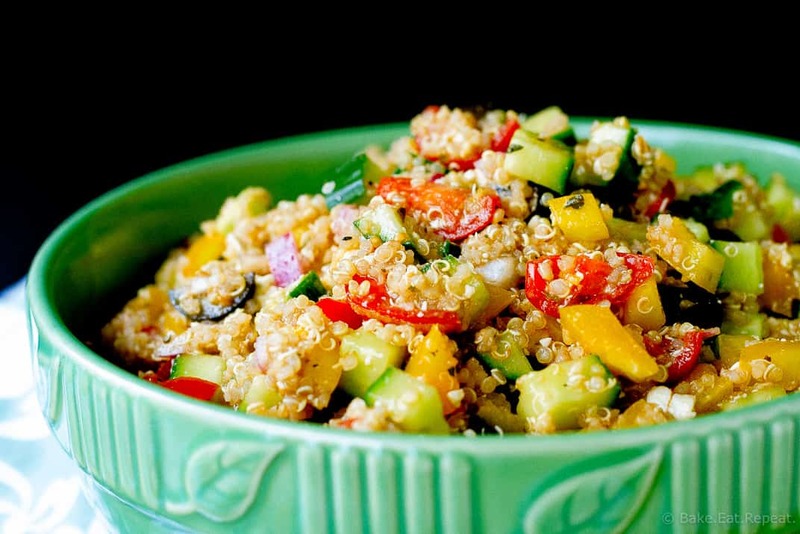 This quinoa salad looks spectacular, Stacey! Love the greek flavors you've incorporated here. Isn't quinoa delicious? I didn't start eating it until about 2 years ago, and now I'm hooked. I love finding new ways to use it, and this salad looks just perfect! Love the zesty flavors, Stacey! Quinoa IS delicious, so glad I finally discovered it...now if only I could convince the family to like it! :) Thanks Gayle!